A full-grown desert tortoise is approximately one foot long, weighs about 15 pounds and has a life expectancy of 80 years. 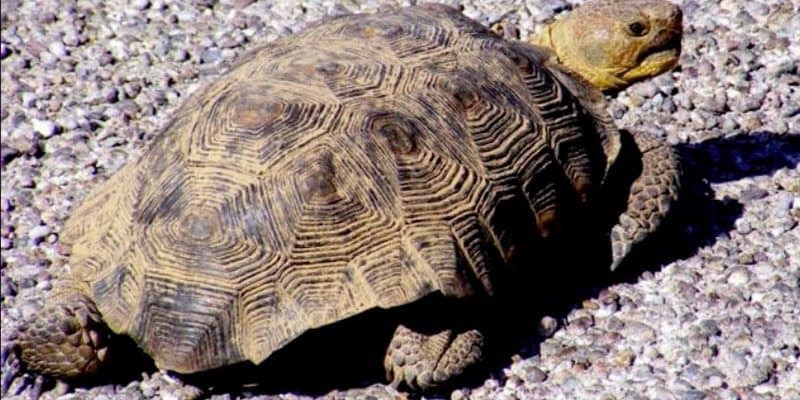 A desert tortoise’s top cruising speed is only about three hours per mile, but it is armored like a military tank and when stationary, it looks like a rock. Tortoises, members of the turtle group of reptiles that live in arid regions, inherit a hard-shelled body design so successful it has remained nearly unchanged since the era of the dinosaurs, more than 50 million years ago. To survive in the Sonoran Desert, desert tortoises have a skin and shell that is impermeable to water and a bladder that operates as a reservoir to store water and reclaim it when needed. As ectotherms (cold-blooded), they burrow into the earth to survive the desert’s severe surface temperature swings; only a few feet underground the earth remains near 55 degrees year-round. Tortoise hatchlings are the size of a silver dollar and are born in clutches of a half-dozen eggs. A full-grown desert tortoise is approximately one foot long, weighs about 15 pounds and has a life expectancy of 80 years. They feed on native grasses, and leafy plants and flowers. A study of desert tortoises in the Sonoran Desert published in 2007 indicates they have different feeding strategies in spring compared to summer. In spring, they eat predominantly annual plants of the legume family. During summer monsoon season they are less selective in diet, possibly because the relative abundance of water allows them to efficiently digest a wider variety of vegetation. This photograph was taken the morning of July 20 2007 on the road to Bear Canyon.